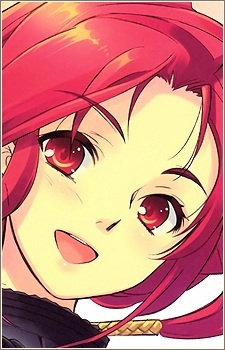 The previous owner of the title "Flame-Haired Burning-Eyed Hunter," she is shown in the flashbacks leading to the ceremony of Shana's ascent as a Flame Haze. She was Wilhelmina Carmel's friend and companion. They were together regarded as the greatest pair, rivaling the "Pair of Wings," a counterpart of the Crimson Lords Merihim and Illuyanka. Mathilde's primary abilities are the same as Shana's, as they both possess the title "Flame-Haired Red-Hot-Eyed Hunter"; the ability to summon flames and use it to empower their weapons. Aside from this, Mathilde can use her abilities as the Flame Haze of "Flame of Heaven" Alastor to summon a flaming horse which she rides whenever she and Wilhelmina Carmel travel. She also uses the Unrestricted Spell "Knights" to summon an army of armored warriors which she uses to defeat a large number of opponents. This Spell can also be used with another, called "Hajoutsuchi" which summons a large battering ram. One of her most powerful attacks, "Vorpal Phalanx," strengthens her attack by utilizing "Knights" to pierce the area where the attack occurs, allowing Mathilde to cleave through stronger opponents. Come meet the characters that populate the fantastical world of Shakugan no Shana!